Return to Mabie, Todd & Co.
Maker: Mabie, Todd & Co.
To speak of the Swan as a model is a little foolish, not unlike saying “Cadillac is a model made by General Motors.” There is so much variation in the Swan that it has to be treated as more of a subdivision, and it is one with which I am sadly not deeply familiar with. 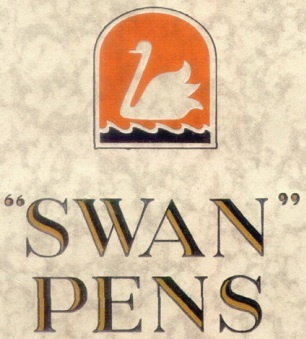 As far as I can discover, Swan was not so much a model as the brand name applied to the fountain pens of the company in toto, at least until the introduction of some of other birds into the aviary, used across a variety of models as was Waterman’s “Ideal Fountain Pen”. Also like Waterman, the actual models are distinguished by a slightly obscure numbering system. In fact, Swans’ numbers are even more occult than Watermans, but are at least a little less arbitrary than those of Conway-Stewart. The earliest Swans were eyedroppers, with a lever-filling option appearing in about 1915. There was also an “Inksight” filler, essentially a bulb-filling arrangement with actual glass portholes in the barrel, which appeared for a time around 1913. This very early, possibly even first, use of a bulb-filler suggest against some accusations of conservatism in the company, although the continued appearance of eyedropper pens under the heading of “Non-Self-Filling” as late as the 1932 catalogue ad possibly beyond undermines notions of forward-thinking. There was also a rather complex accordion-filler and a unnecessarily complicated expression of Parker’s Vacumatic system, from 1934 and 1937 respectively, both using the name “Visofil”, and some slightly more reasonable (from a repairman’s point of view) twist-fillers, which also showed up first in 1934. Levers continued to be available, right though the post-war production. In 1924, some variants of Swan were labelled “Eternal”, in keeping with the vogue started by Sheaffer for life-time warranties. This was a superior line within the Swan family, which meant from that point it was possible to buy a Swan without buying the best sort of pen Mabie, Todd & Co. made. Post-war examples frequently have a separate brass ring for the threads to hold the cap to the barrel. This appears to have been done for purely decorative reasons, as there’s no structural nor functional rationale for it. Production Run: 1884 – c. 1950 (broadly; specific models may vary as noted, and with a break due to bomb-damage from c.1940 to c. 1946). 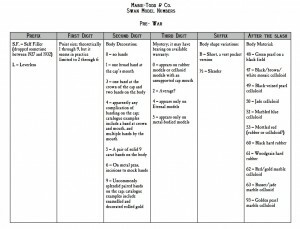 Cost When New: Noted on individual examples, where available. Body: Hard Rubber in earlier models with metal overlay in some cases, switching gradually to celluloid in the 1930s. Post-war models: Production run: c.1947 – c. 1950. Cost not currently known. Lever filler, capacity approx. 1.1 ml. Dimensions: capped 13.0 cm, posted 15.3 cm, uncapped 11.8 cm. Swan 3261; a strange hold-out use of black hard rubber.